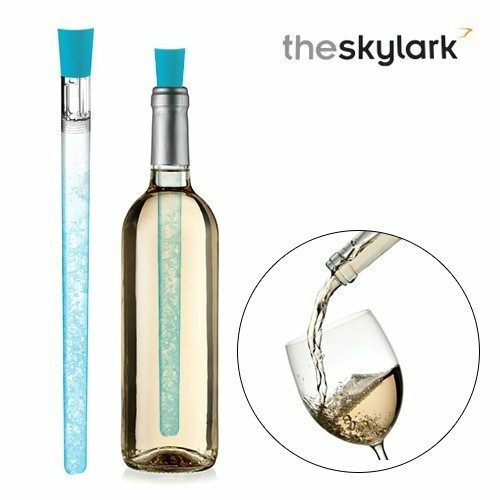 Skylark Wine Chilling Stick With Sealer Only $8.99! Ships FREE! You are here: Home / Great Deals / Skylark Wine Chilling Stick With Sealer Only $8.99! Ships FREE! If you like to have chilled wine quickly and without watering it down with ice, then check out this deal! Order the Skylark Wine Chilling Stick With Sealer for Only $8.99! Ships FREE! Keep wine chilled inside the bottle with this convenient Wine Chilling Stick with Sealer featuring a transparent gel-filled plastic chilling stick with a light blue sealer. Simply refrigerate the stick and place inside bottles. Wine can be preserved well with the sealer. FDA grade. Portable and reusable. Measures approximately 12″ long. Click here to check out more Great Deals!